The professional staff at MasterDry can help a grieving family by dealing quickly and effectively with a trauma / crime scene cleanup. Our employees are sensitive to a family's grief, and will thoroughly explain the process that may be required for their particular situation. We are happy to work with an agent (a friend or family member) so the family need not be involved in any significant way. If you've been the victim of a crime, you need professional crime scene clean-up you can depend on. In the aftermath of a fairly traumatic event - a violent crime and the police response to it - you need a qualified crime scene clean-up company. Master Dry understands that you need a helping hand to clean-up the mess a crime has left in its wake and that's why we're here. Master Dry’s Bio-Recovery Divison will assure you that your family and your home or property will be afforded the protection it needs from potential bio-hazards - blood, body tissues, etc. During this difficult time, Master Dry will be here to ensure that you receive the competent and considerate crime scene decontamination and remediation services you deserve. The highly trained technicians at Master Dry will decontaminate and remove any blood, tissue or bodily fluids a violent crime has left behind and clean-up and remediate any fingerprint dust or tear gas used during the police response. 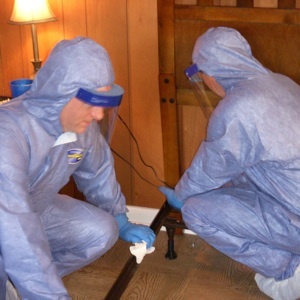 Whether your home or business has become the scene of a homicide or murder, a burglary, break-in, or other violent crime, our crime scene technicians have the training and experience to thoroughly clean and decontaminate the scene. Remember, you can't handle crime scene cleanup on your own. That's why it's important to hire a professional scene cleaning company such as Master Dry with the training and experience to work with First Responders. Whether the scene is at your home and personal property, a commercial business, or industrial site, we'll strictly adhere to OSHA regulations and API Worksafe guidelines in our cleanup efforts and only deploy EPA registered hospital grade cleansers and disinfectants. You need professional scene clean-up technicians to be sure that your home is truly clean. Your safety is our business. If you need crime scene clean-up guidance, have questions about your payment options, which crime scene clean up procedures your current insurance policy covers or require our cleanup services immediately call Master Dry at 877-65-FLOOD.